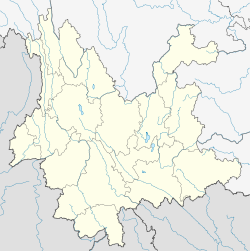 Dali City (တရုတ်: 大理市; ပင်ရင်: Dàlǐ shì; Bai: Darl•lit; Hani: Dafli) is a county-level city in and the seat of the Dali Bai Autonomous Prefecture, northwestern Yunnan province of Southwest China. တာလီမြို့သည် ၈ ရာစုနှင့် ၉ ရာစုများတွင် ဖွံ့ဖြိုးခဲ့သော နန်ကျောင်နိုင်ငံ(မြန်မာအခေါ် နန်းစော)နှင့် အေဒီ ၉၃၇-၁၂၅၃တွင်တည်ရှိခဲ့သော တာလီနိုင်ငံများ၏ မြို့တော်ဖြစ်သည်။ Situated in a once significantly Muslim part of South China, Dali was also the center of the Panthay Rebellion against the reigning imperial Qing Dynasty from 1856–1863. It was severely damaged during an earthquake in 1925. Dali is also famous for the many types of marble it produces, which are used primarily in construction and for decorative objects. In fact, Dali is so famous for the stone that the name of marble in Chinese is literally "Dali Stone" (တရုတ်: 大理石; pinyin: dali shi). Dali is now a major tourist destination, along with Lijiang, for both domestic and international tourists. တာလီမြို့နှင့်ယူနန်ပြည်နယ်မြို့တော်ကူမင်း(ခွန်းမင်)သည် လေကြောင်းဖြင့် မိနစ် ၄၀ ကြာခရီးကွာဝေးသည်။ . Dali's newly finished administrative district that houses the newly opened Dali International Convention Center is in Longshan District. The Dali government's urban planning keeps its old and new districts separate, to encourage tourism. မြို့သစ်ဖြစ်သော ရှကွမ်းတာလီမြို့သည် မြို့ဟောင်း၏တောင်ဖက်တွင်တည်ရှိသည်။ The old city was built during Ming Dynasty emperor Hongwu's reign (1368–1398). Owing to the distance between them, the old city is still peaceful and quiet. Tempered by the low latitude and high elevation, Dali has a mild subtropical highland climate (Köppen Cwb), with short, mild, dry winters, and warm, rainy summers. Frost may occur in winter but the days still generally warm up to ၁၅ ဒီဂရီ စင်တီဂရိတ် (၅၉ ဒီဂရီ ဖာရင်ဟိုက်) or more. During summer, a majority of the days features some rainfall, and daytime temperatures rise to ၂၄ ဒီဂရီ စင်တီဂရိတ် (၇၅ ဒီဂရီ ဖာရင်ဟိုက်). A great majority of the year's rainfall occurs from June to October. Shuang lang: on the opposite side of the lake, a small fishing village where the guesthouse owners of Dali come to take a break of the busy life in Dali. Local transport modes include buses (11 routes in the city proper), taxis, bicycles, and boat (on the Erhai Lake). Dali Airport (destinations: Kunming 20 min, Xishuangbanna 25 min, Chengdu 80 min, Chongqing 70min). The airport is 13 km to the east of Dali City (via Weishan Road or Airport Road), taxi fare Y50. Dali is a domestic airport with connections to Guangzhou and Beijing. There is a Freeway between Dali and Chuxiong. From the bus stop near the west gate in Dali there are daily buses to Shangri-La County and express buses to Kunming. Travel time by road to and from Kunming is about 3 hours and 30 minutes. Express buses to Lijiang and minibuses also leave from here. A bus leaves for Shaping every Monday morning for the market. The three biggest long-distance bus stations of Xiaguan (the "new city") are all located on Jianshe Road. There are daily trains and long-distance buses to Xiaguan from Kunming. From Xiaguan, there is a direct bus (No.4) to the Old Town of Dali. The bus No.8 links the railway station, the East and the North bus station of Xiaguan with the old city of Dali. Dali has rail connections to Kunming via the Guangtong-Dali Railway and Lijiang via the Dali-Lijiang Railway. Daily train service is available to and from Kunming (1 day-train and 2 sleeping trains) and to Lijiang. 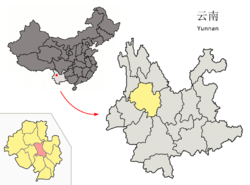 As the railway network expands in Yunnan, train service will become available to Shangri-La County and Ruili.